Every year Shankarajayanti is celebrated in a grand scale at Shankaracharya hill in Srinagar. One of the oldest temples of India known as Shankaracharya in Srinagar Kashmir has a Shiva temple which is more than 2300 years old. Adi guru Shankarachrya came and mediated here, This year Shankarajayanti is on April 20th. Adi Guru Shankaracharya had travelled throughout Bharat several centuries backand had established 4 mutts in four corners of the country and spread knowledgeand wisdom throughout. 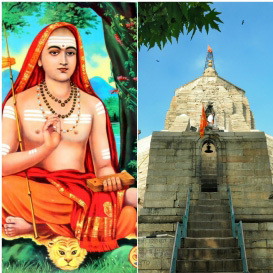 On the day of Adi guru Shankaracharya Jayanti, thegreatest way to remember and follow his teachings was by praying for a StrongIndia and a peaceful Kashmir. The belief in Sanathana dharma is, whenever there is a disturbance in the societygod send a divine person to clear the ignorance and restore the social order. It isthe prayers of several people which materialises into an avatar. 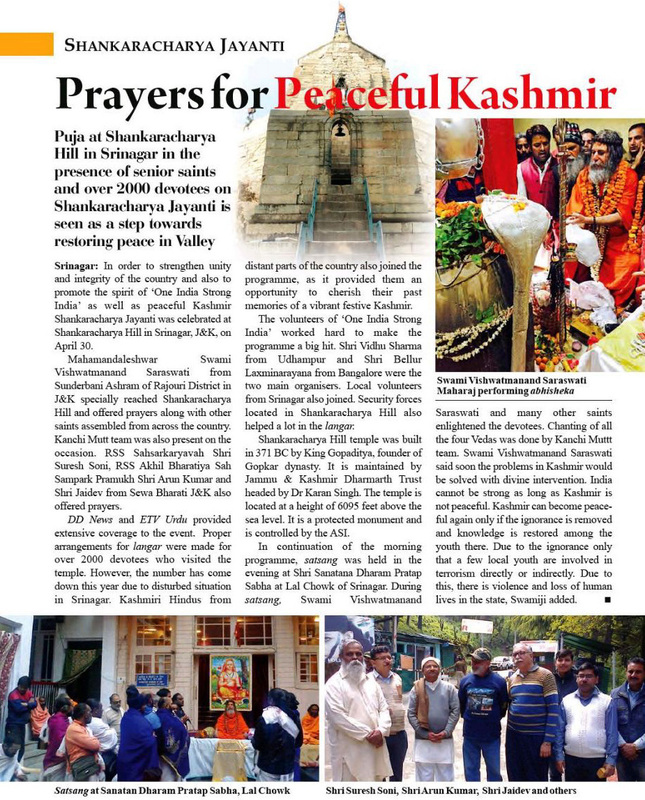 By the prayers ofseveral people at Shankaracharya hill, an avatar may come to Kashmir or someperson may get enlightened and may lead all the other people to the right path of peace. Swami Vishwatmanand Saraswati Ji Maharaj from Sunderbani Ashram in Rajouridistrict J&K came to Shankaracharya hill and oered his prayers along with severalsaints from across the country and along with his disciples. Kanchi Mutt carried out Vedic chants. The Shankaracharya hilltemple was built in 371 BC by king Gopaditya, founder of Gopkar dynasty. It is maintained by the Jammu and Kashmir Dharmarth Trust, the Chairman trustee is Shri Karan Singh Ji. The temple islocated at a height of 6095 feet above the sea level, It is a protected monument by Archaeological survey of India.